Not too long ago we made our C-ROADS simulation available to anyone who wanted it. Today, we are excited to find that the hundreds of C-ROADS users can be found in more than seventy countries worldwide. Our C-ROADS simulation, can help just about anyone understand the long-term impacts of policy scenarios to reduce greenhouse gas emissions on our climate. From environmental NGOs in Costa Rica to school teachers in Austria to climate negotiators in the US, our users are not only found in diverse locations but come from a wide range of sectors and use C-ROADS for many different purposes. Know someone in a nation or region not on our map who could put C-ROADS to use? Send them our way. 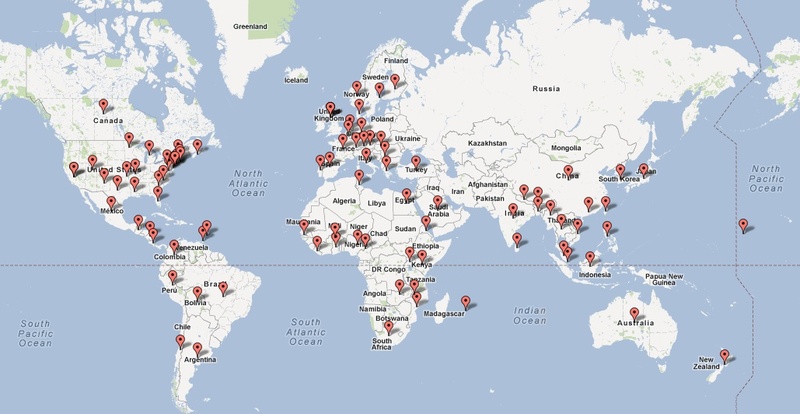 The hundreds of C-ROADS users can be found worldwide in more than 70 countries.